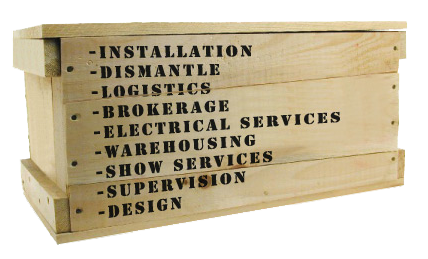 Our complete trade show services allow you to concentrate more on preparing for your trade show and leaving the “heavy lifting” to us. We take care of all the many logistical things that need to be done in order to have a stress-free and successful trade show. Some of our services are design, shipping, installation, electrical, supervision, after the show dismantling, and finally warehousing the booth for your next show. Logistics of any Trade Show event is crucial for a successful show. Basic things like crate construction and more complex services of handling freight companies and the brokerage when shipping to different countries. At the show equally important is installation of your booth in a professional and timely manner. This service continues to be very hands-on during your show with any show services you may need. These services truly gives you peace of mind and let you do what you do best during the Trade Show. Give us a call and find out more about our full trade show services!